Top to bottom: 16 Spice Chicken, Corn Tamale, Mixed Veggies, & Spice Rubbed NY Strip Steak. Mesa Grill. We all eat out, some of us more than others and what we rarely consider is the cleanliness of the places we patronize. I have, however, often wished I could know precisely what score a restaurant has earned. It’s obviously very salacious a topic as in Austin and San Antonio I was aware of local news programs airing some sort of “Behind the kitchen door” segments exposing dirty restaurants. But how much information is too much? Do you want to know the numerical grade, an equivalent letter grade, and each specific violation? On a recent weekend my most loving husband planned a dinner for us in the historic and shrinking Little Italy. I was so pleased that he had gone to the effort of planning the night on his own that I happily walked right up to the restuarant of his choosing with the help of the Zagat 2011 guide. Hand in hand, smiling and chatting we both stopped cold in our tracks as we saw the scarlet letter “C” hanging in their front window. How could this be? I thought that “C”s just failed immediately, who would eat at a “C!”. Little Italy is small, shrinking even and each restaurant holds on to their territory tightly with a doorman charming people into each door. This is all very nice but when there’s a big bold “C” on their front window all the charm in the world just can’t sway me. We took it in stride – ‘who cares, that they were so highly rated in Zagat.’ BUT then we came across a few more “C”s which really began to give me a sinking feeling. We were down to just a couple of options. Luckily we landed in a very tasty “A,” Amici II, and will most definitely go back. Cut to a few weeks later – our “A” streak continued until we made reservations at Bobby Flay’s Mesa Grill in the Union Square neighborhood. Although I am in the habit now of checking the handy-dandy Health Inspection website prior to going somewhere, I didn’t. Of course a celebrity restauranteur would earn the highest grade! Paul had to convince me to go in when I saw the dreaded “Grade Pending” hanging in their window! Once I was seated I pretty much forgot the grade situation and fully enjoyed my meal but later I couldn’t help but wonder what their “Grade Pending” meant – surely it was a fluke! Regrettably, I couldn’t resist. Not only did they have 22 points with 4 “critical violations” on this inspection they have a history of earning poor scores before the posting was even required. If a restaurant gets a bad score they re-inspect again fairly quickly, if they get a good grade they won’t re-inspect for at least a year. In May 2008 they only had 6 points. Then in May 2009 – just one year later – they had 27 points!! Then they were inspected 3 times in 2010 earning 25, 18, and finally 22 points. This truly breaks my heart because not only was the food absolutely beautiful but it was also delicious and I have been craving the corn tamale ever since we left! Needless to say, we won’t be making a return visit very soon. I expect they’ll complete their appeal process soon and their re-inspection can’t be too far away. I can only hope that they’ve learned from their mistakes now that the city requires public posting of the grade in such a bold way. I should note as a final thought that the “A” we found ourselves in, Amici II, scored a 12 with only two violations but they were both considered “critical.” I am going to have to let this go but don’t you wonder what your favorite places might score? 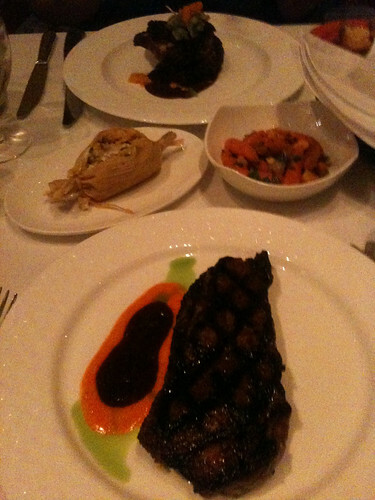 This entry was posted in everything i've blogged, food and tagged dining out, NYC, Union Square. Bookmark the permalink. 2 Responses to What’s in a grade?